my grandmother taught me the power of one-pot. as a homemaker and working mother she was committed to make sure that her family ate well each and everyday. to this end she designed the one-pot system. at breakfast she planned her pot. she might cut up vegetables or send someone to the store to pick up a missing item. but before the breakfast dishes were in the sink supper would be started. slowly the pot would simmer so that by lunch it was ready for the first taste. her one-pots were simple dishes that sometimes served as a complete meal, a main course, or a simple side to go with two or more other dishes. she taught that the pot size you use depends on the number of mouths you intend to feed. her pot was a massive 6 gallon cannon. my mother owns a 4 gallon. my own is merely 2. the one-pot philosophy holds a simple truth at its base: always be ready to feed the hungry. granma was never specific about what should or should not go in the pot. she did believe in hardy meals. sometimes her one-pot would be a mixture of collard, mustard and turnip greens simmered slow with a ham hock as its base. to this one-pot she would add fried or baked chicken and cornbread. she had another one-pot i now call succotash but i’m sure she would not have named it so. 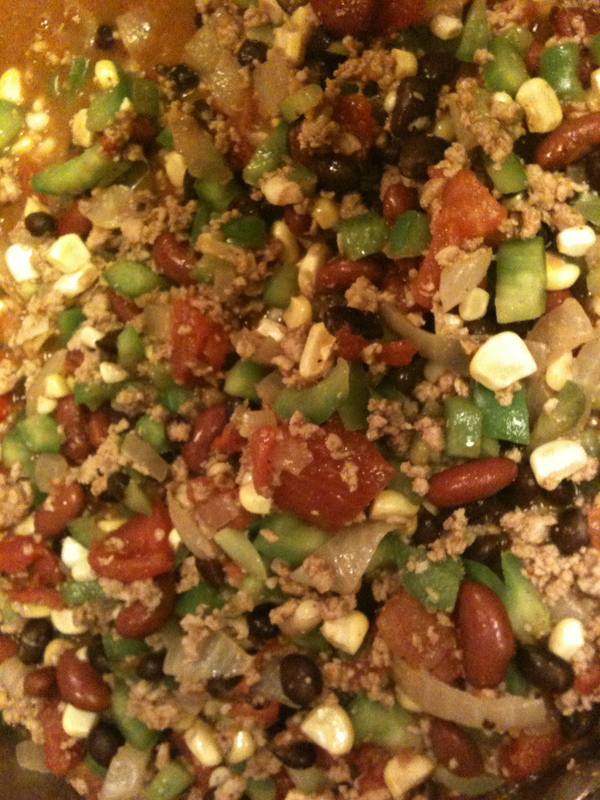 it was another vegetable based pot that could include lima beans and corn but sometimes there was a happy accident and it would turn into chili. no matter the original recipe every one-pot could stand alone as a meal by itself. in my own foray as a homemaker, i’ve taken on my grandmother’s one-pot philosophy although i honestly don’t need to have a pot going everyday; my household being significantly smaller (family of 2) than the brood she raised (seating for 12). i sometimes use her recipes though, mimicking scents and texture to get a meal going creating more accidents (though not so happy) because she never wrote any of her recipes down. i miss my grandmother. everyday. putting a pot on, listening to the onions sizzle and watching a meal come together remind me. stirring the pot with my wooden spoons i mimic her. and when i use my hands to measure – a touch of this or a dash of that – i call on her to help me praying to not ruin another pot. she’s there in the details. i can feel it. tonight my one-pot was a red black and gold chili. its a recipe i’ve been using for years though i don’t think i’ve ever made it the same way twice. sometimes i use bulghur instead of meat and other times i leave the protein out of it altogether. but i love the colors of the dish as well as how hearty and filling it can be on a brisk fall evening. my 2 gallon pot reaps enough for a week’s worth of leftovers. my lunches for the week now set i can go about planning what i’ll be writing for my blog and sorting through clothes now 2 sizes too big. at some point in the week i’m sure the leftovers will turn into a chili base casserole with cornbread topping. but for now my house is filled with the scents of cumin and onions. it makes the night air less chilly and this old house a whole lot friendlier. one pots are simplicity at its best. and that’s this week’s word – simplicity. fall to mean is represented in the wonderful aromas of a one-pot meal full of flavor and the prospect of a family gathering. peace to you.